BBC NEWS | South Asia | Did animals have quake warning? Did animals have quake warning? Do wild animals have a sixth sense? Wildlife officials in Sri Lanka have reported that, despite the loss of human life in the Asian disaster, there have been no recorded animal deaths. Waves from the worst tsunami in memory sent floodwater surging up to 3.5km (two miles) inland to the island's biggest wildlife reserve. Many tourists drowned but, to the surprise of officials, few dead animals have been found. It has highlighted claims that animals may possess a "sixth sense" about danger. Yala National Park in Sri Lanka is home to elephants, deer, jackals and crocodiles. Praised for its conservation, the park is also considered one of the best places in the world to observe leopards. 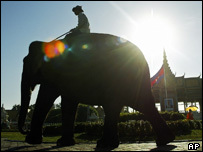 It is now closed after floods damaged buildings and caused the deaths of tourists and employees of the park and lodge. Debbie Martyr, who works on a wild tiger conservation programme on the Indonesian island of Sumatra, one of the worst-hit areas in Sunday's disaster, said she was not surprised to hear the animals had avoided the catastrophe. Wild animals in particular are extremely sensitive... They've got extremely good hearing and they will probably have heard this flood coming in the distance. "Wild animals in particular are extremely sensitive," she said. "They've got extremely good hearing and they will probably have heard this flood coming in the distance. "There would have been vibration and there may also have been changes in the air pressure which will have alerted animals and made them move to wherever they felt safer." There are many eyewitness accounts of birds and animals migrating before earthquakes and volcanic eruptions. The scientific evidence for a sixth sense is lacking, but if these reports are confirmed, they could add to the understanding of animal behaviour and possibly even be used in the future as an early warning system for humans.